Though the word “cosmology” is of recent origin, being first used in 1730 by Christian Wolff in his book “Cosmologia Generalis”, and we can probably assume that it he meant to give a label the study of the makeup and meaning of the Universe itself going back to the very dawn of mankind and to the first creature who looked up into sky and realized that there was something much bigger than he was and who began to wonder what his place in Universe might be. Such is the problem with “labels”. A “label” is generally thought of as a word or phrase that describes someone or something to indicate its makeup or nature. It is a way of saying that “this” belongs in a particular category or classification. It defines “this” as being one thing, but not another. We then put that thing in a bin with other things of that nature, separate from all the other things that are not of that nature. Unfortunately labels are generally decided on by people’s limited understanding of what that thing is, mixed with their biases and prejudices and more often than not things get thrown in the wrong bin and once in the wrong bin, it is almost impossible to get them placed in the right bin. Look at two of the most commonly used words in science; the “atom” and the “universe”. “Atom", (from the Greek "atmos": indivisible), meaning the smallest thing that could possibly be, and "Universe", (from the Latin "universum": single, or whole), meaning the largest thing that could possibly be. Originally, the universe was meant to be the planets and stars in a system with the Earth at the center. But, Nicolas Copernicus’s model of a Sun-centered (heliocentric) system changed that view of the boundaries of what could be. Galileo Galilei and Isaac Newton pushed the boundaries out even further and by the time of the modern astrophysicists it became apparent that there existed not one, but many universes. Likewise, Einstein and other physicists proved that the atom was not the smallest thing possible, but it was made up of smaller and smaller parts. Yet, even though we now know that these labels were wrong, we are still using the same bins to throw things in. If we take Wolff, “at his word”, the word “cosmos” comes from the Greek word “kosmos” meaning order, so “cosmology” would simply and logically mean the study of an orderly or harmonious system which explains the nature and meaning of everything. 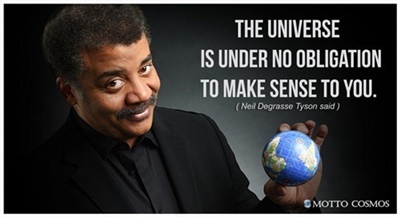 However, today, the word cosmos is generally used as a synonym for “universe”. By coming up with the term “cosmology”, Wolff probably assumed that he was adding a word to the lexicon that would create one huge single “cosmology tent” under which all those who studied the workings of the heavens, from whatever perspective, could come together in a harmonic unity of purpose. Unfortunately the term cosmology did not have the unifying effect Wolff might have hoped for. All Wolff was really able to accomplish coming up with this new word was to come up with a new bin to try to rearrange things into and a new word to mark on its label. As is quite natural given people’s biases and prejudices, Wolff’s “heavenly tent” turned out to be a lot like Heaven must be when someone gets there and finds that his enemy is there as well. People have their own ideas about how they and their ideas should be labeled, that way they can keep “the wrong people” and the “wrong ideas” out of their bins … or tents. Wolff’s unified “cosmology tent” soon turned into a fractured campground of more or less warring tribes. The first thing we discover about what is in the cosmology bin is that it is filled with everyone’s theories about what they think the answer is, which nobody else agrees with. The first problem then would seem to be that before we can all agree on an answer, we must all first agree on a question. The second problem then would seem to be that before we can agree on a question and set out to discover the answer to that question we have to understand “why” we want to know the answer. The words physics and metaphysics derive from the Greek words (physiká), meaning "physical" and (metá), which means "beyond". In general use, the word physics has come to mean the study of the physical world and metaphysics the study of the non-physical or spiritual world. Yet, met means “beyond” so it more properly could mean.... that which is beyond physics or that which is currently beyond understanding of physics. But as the study of astrophysics and quantum physics have demonstrated, the more that we learn the more we realize that we do not know and in turn, how little we really do understand. All that being so, we must then attempt to define the two main tents under which the explorers into the nature of the cosmos gather and see what banners (or labels) they fly for themselves. Physical cosmology, being a modern scientific discipline arising out of Sir Isaac Newton’s revolutionary work, which seeks to understand the origin, evolution and ultimate fate of the Universe, as well as the scientific laws that explain the order of its structure. In short, modern cosmology is study of the Universe in its totality, from the perspectives of the laws of physics and astrophysics and is dominated today by the Big Bang theory of the beginning of creation. Metaphysical cosmology, being a spiritual inquiry arising out of mystical experience, beginning with the first attempt by humans, looking up into star filled night sky in the hope of understanding the Universe and by extension, humanity's place in it. A first step in man’s long journey on the paths of philosophy and religion, in search of an explanation for a world full of terrifying things and events, in hopes that understanding the true nature of those things and events might to make life a little less scary. Metaphysical cosmology did not begin with a big bang, but with a sorrowful whimper of frightened, primitive man alone in the long dark night. As with physics and metaphysics, our modern way of thinking has split these two avenues of exploration. The paths of science and mysticism are split into opposing camps, each looking to explain the Universe from individual and opposing perspectives. It is an either science or mysticism conundrum. But, as many are beginning to realize, neither path will lead to an explanation that will satisfy both the human intellect and the human spirit. A road paved with a mixture of science AND mysticism may prove to be the surest way for us to travel to get us all where we want to go.